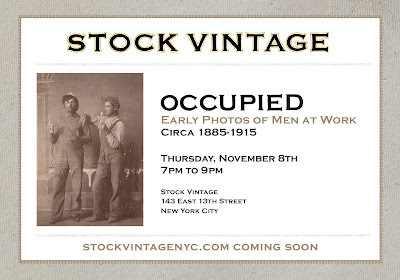 STOCK VINTAGE (MY FAVORITE MEN'S VINTAGE CLOTHING SHOP) IS HAVING AN OPENING OF EARLY PHOTOS OF MEN AT WORK. ALL IN FINE EXAMPLES OF PERIOD WORK WEAR, I'M SURE. IF YOU ARE AROUND DON'T MISS IT. If that's your favorite you've obviously haven't visited Bobby's of Boston. Incredible store. Highly recommended, plus better stock and much much better prices. Check it out. WOULD LOVE TO GET THERE NEXT BOSTON VISIT.